"Tsifran" is an antibacterial drug belonging to the group of quinolones/fluoroquinolones. Active component of drug is ciprofloxacin. "Tsifran" is used for the treatment of infectious-inflammatory diseases. 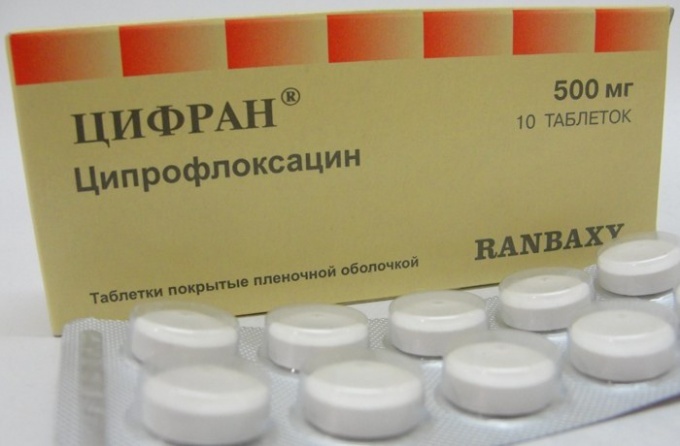 "Tsifran" is prescribed for the following diseases: infections of the genitourinary system (chronic and acute pyelonephritis, cystitis, prostatitis, epididymitis), infection of the respiratory tract (bronchopneumonia, pneumonia, exacerbation of chronic bronchitis, acute bronchitis, pleurisy, lung abscesses, empyema, gonorrhea, proctitis, urethritis, infections of ENT organs (medium and external otitis, sinusitis, mastoiditis), infection of skin and soft tissues (burns, wounds, infected ulcers, abscess), infections of gastrointestinal tract (peritonitis, typhoid fever, cholangitis), infectious-inflammatory diseases of the pelvic organs (endometritis, salpingitis), infection of joints and bones. Dose and duration of treatment "Tsifran" determined by a doctor, individually in each case based on the severity of the disease, identified the causative agent, the patient's age, weight and renal function. Children 12 years "Tsifran" administered in a daily amount of 5-10 mg per 1 kg of body weight, which is divided into 2 admission. The tablets should be taken before meals. Adults "Tsifran" enter intravenous (slowly) in the form of infusion in 200 mg 2 times a day for infections of the urinary tract and lower parts of the extremities. In other infections the drug is administered in an amount of 200 mg at intervals of 12 h In cases of disorders of the kidney daily dose reduced by 2 times. In some cases, after the on/in the introduction switching to oral means. Treatment of acute infectious diseases is carried out at least 5-7 days., after the disappearance of symptoms the course is extended another 3 days. Side effects and contraindications to the use of "Tsifran"
"Tsifran" can cause such side effects as bloating, vomiting, nausea, abdominal pain, hepatitis, headache, paresthesia, dizziness, irritability, confusion, fainting, migraine, tremor of the extremities, disturbances of vision, smell, taste, heart rhythm disturbances, eosinophilia, leukopenia, leukocytosis, anemia, thrombocytosis, haemolytic anaemia, increased liver enzymes, hyperglycemia, hematuria, glomerulonephritis, dysuria, polyuria, urinary retention, urethral bleeding, myalgia, arthralgia, tenosynovitis, arthritis, tendon rupture, pseudomembranous colitis, candidiasis, weakness. The drug is contraindicated in hypersensitivity to components, pregnancy and lactation, children under 12 years. With extreme caution "Tsifran" is used in people with acute manifestations of atherosclerosis of cerebral vessels, cerebral circulation, mental illnesses, epilepsy, epileptic syndrome, hepatic and/or renal insufficiency in the elderly.